Pallet Shippers are the perfect systems for bulk consignments. Today we have come to almost take their importance – and indeed, their genius – for granted. But there can be no doubting the incredible impact they have had on the handling and efficiency of mobile goods. Just the idea of being able to move one hundred boxes at a time, versus one, or taking an hour to unload packages as opposed to a day, needs no explanation. At Softbox, we have been embedded in the journey, and the history. Our Silverpod® pallet shipper was the world’s first container created for aircraft unit load devices; its inception represented a leap forward for the freight-forwarding sector. But our commitment to continually developing products that improve supply chain operations means our innovation efforts haven’t stopped there. 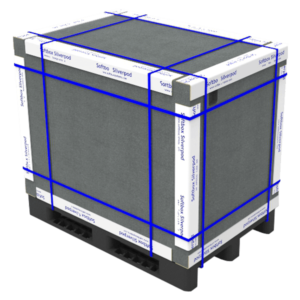 Softbox pallet shippers are isothermal and will maintain product temperature stability for bulk loads for up to 120 hours. Coupled with their strength and durability, shipments are protected from potential damage in the handling process. Being pallet based, they are also elevated from ground level, safe from wet or unfavourable conditions. Our pallet shippers are highly cost-effective in comparison to multiple parcel shippers. They are relatively lightweight by design, maximise space, and as a single entity housing numerous units, they can be easily tracked and transported. This portability enables quick and efficient movement, keeping product excursions at bay and dramatically reducing labour handling requirements. Being the world’s first container created for aircraft unit load devices, Silverpod® has always been top of mind in the global, bulk, air freight-forwarding sector. This best-in-class temperature control pallet shipper meets all temperature ranges for all modes of transportation, safeguarding the integrity of even the most sensitive product shipments for 120 hours or more. Yet its configuration is such that it offers cost reductions in packaging, freight and warehousing. They are supplied flat-packed for cost-effective delivery and storage, and are incredibly user-friendly to condition and assemble. Silverpod® pallet shippers are available globally and come in four workable sizes.